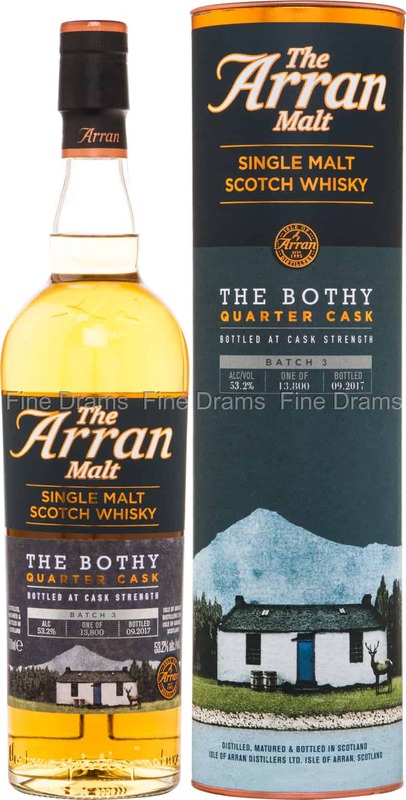 The third batch of Arran’s fantastic Bothy series. The name Bothy refers to a small building which offered shelter to travelers traversing Scotland’s highlands and islands. A Bothy is small, but delivers great comfort and warmth to those lucky enough to find one – the same is true of this lovely bottling. This bottling was first matured in first-fill former Bourbon American oak casks, just like batches 1 and 2. For batch 3, the whisky was then finished in American oak quarter casks for at least 18 months. Quarter casks were previously used because of their increased portability in a time when horseback transport was most common. Nowadays, they are valued by distilleries for adding a strong oaky note to their whiskies. Such is the case with this dram, which marries Arran’s classic earthy, spicy malt flavour with notes of bright fresh oak, vanilla, wood spice, almond, cinnamon, waxy citrus, apples and preserved lemons. A surprisingly refreshing whisky, bottled at an intense 53.2% ABV, and without either chill filtration or colouration.